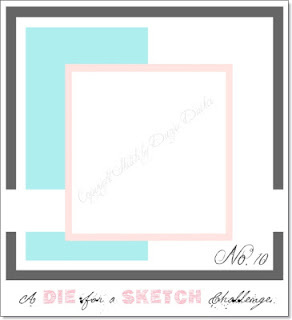 All you do is follow the sketch and use 1 die cut. So simple and you have the month of March to enter. Ahh isn't he cute!! I colored my little bunny in Copics on Cryogen paper. My DP is from Graphic 45 the new Secret Garden. Along the left side I used a Spellbinders border die and then a Cheery Lynn die for the flowers. My eggs on the bottom left is a Magnolia mini stamp. It fit perfectly on the card as a embellishment. I adorned the scallop chipboard with diamond jewels and added stickles to the bunny and Magnolia eggs. The inside left is white card stock embossed with Darice Embossing Essentials. In person this embossing folder is gorgeous. Another Cheery Lynn flower and brad next to the sentiment from Papertrey Ink. I am looking forward to you entering our Challenge at A Die For A Sketch this month! 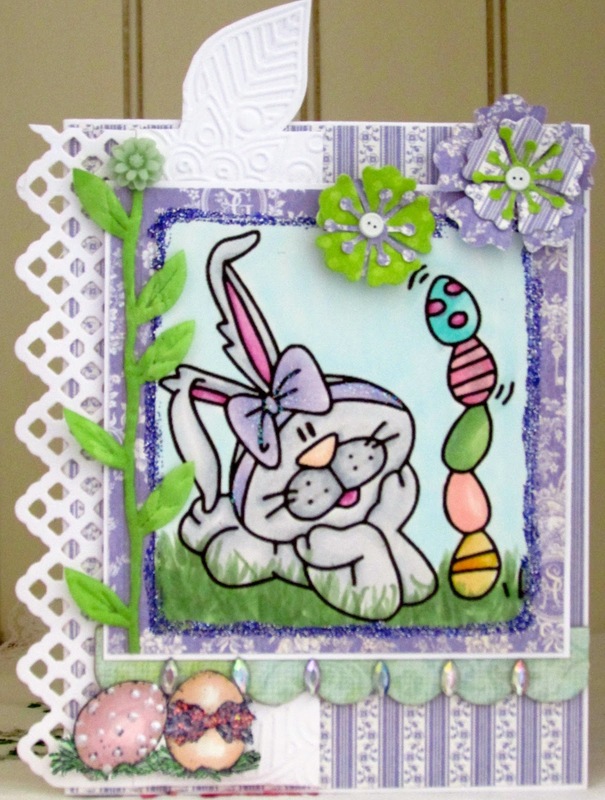 This card makes me so 'hoppy.' Ha! I couldn't resist. I love the way you've colored up this cutie and drew the grass up over him. Really like the flowers and that precious little Magnolia egg stamp..that's so cute! Beautiful card Kelly and that's no yoke! LOL..I can't stop!! Yes, he's so cute Kelly and I love your colouring and that gorgeous design you created. The border die is really pretty and I like the look of the secret garden paper. Hope everything is good with you and yours and you're getting plenty of art in! Cute as can be Kelly -- I really like those little eggs in the left hand corner! How cute! Great coloring and I love all of your yummy details. This is such a cute card! 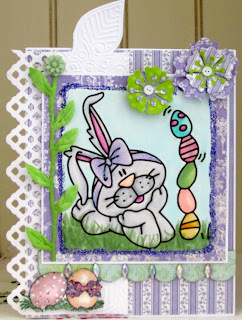 Fun image and I really like those eggs in the bottom left corner you made from the Magnolia stamp. Great layout and I like the colours - purple is always a fave.